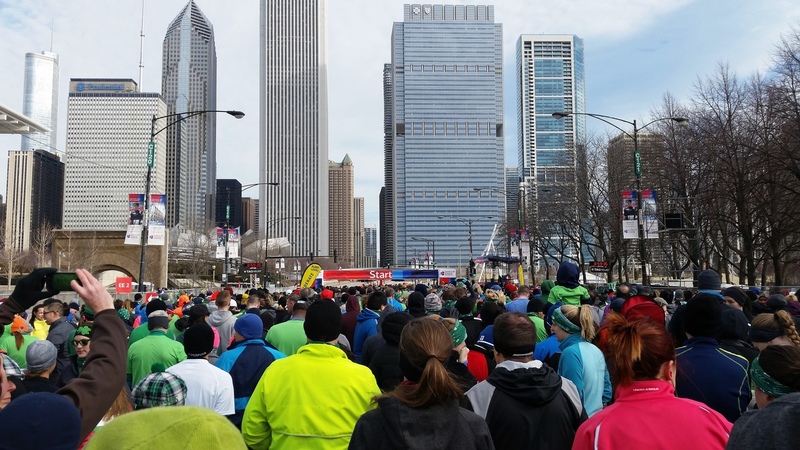 The 2015 Bank of America Shamrock Shuffle 8k was my first race. 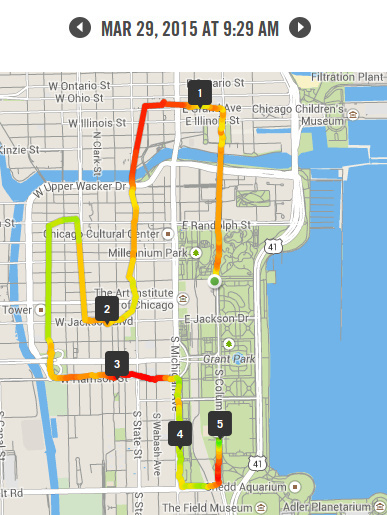 It was just under 5 miles on the Sunday before the Chi-town Half Marathon, so it fit in pretty well with the Nike+ Running Coach half marathon training schedule and was a good opportunity to go through the race experience at an easier distance before the half. 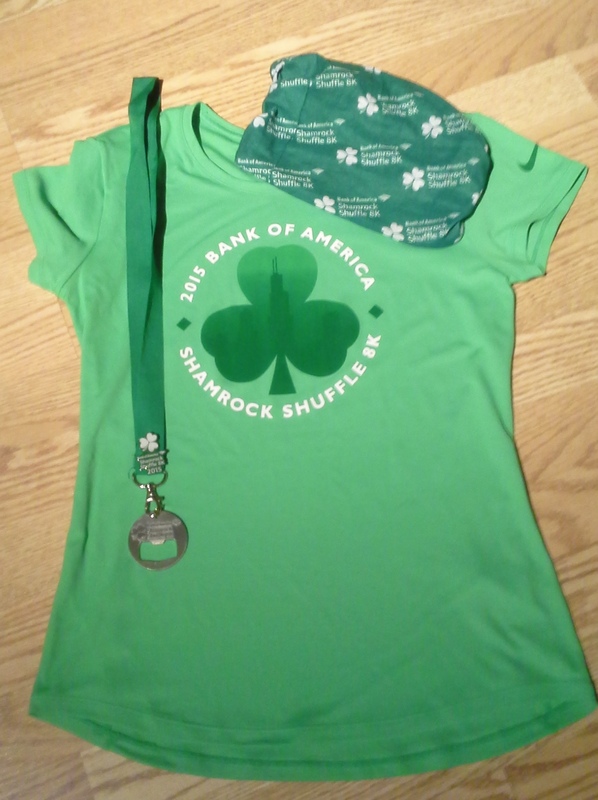 2015 Shamrock Shuffle Nike dri-fit shirt (I got a Womens' small, fits well), gaiter, and medal (with pin). We picked up our race packets at the fitness expo Friday night before the race. The race registration cost was $50 (plus another $10 for parking at the McCormick expo). Gear included a Nike dri-fit green short sleeved shirt and a “gaiter” scarf thing (awesome). The expo also had free Michelob Ultra beers. 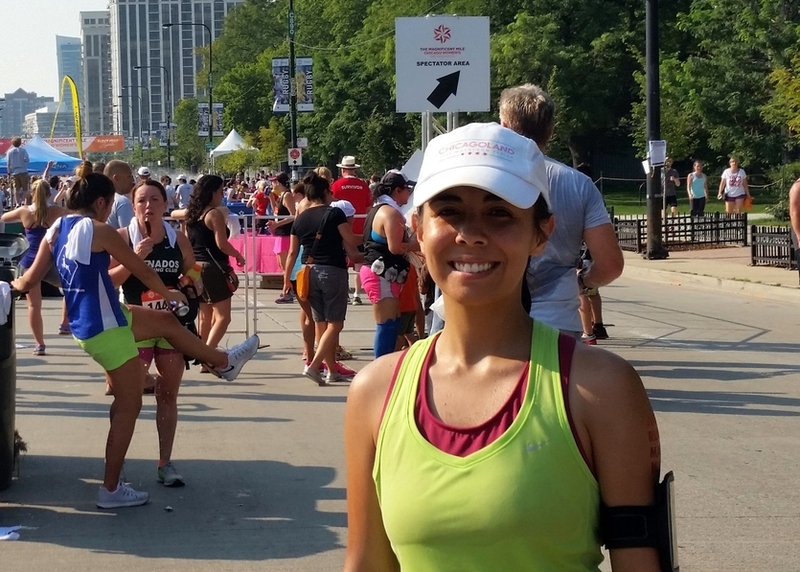 We didn’t stay too long, but I signed up for several more races (got some good discount codes/coupons) and grabbed some extra swag- highlights were Magnificent Mile sunglasses and a headband sweatband thing. This year there were 22,877 people who finished the race, 12,847 of whom were women (56%). Given the large number of entrants, the race was organized into two waves with a 45 minute separation in start time. I had registered in the 11:30’ pace corral (second wave) but decided to try and go for a 10:30’ pace finish. The weather held for the race but started to turn pretty ugly (cold and rainy with a little bit of hail- got immediately sick with a cold afterwards), and so we didn’t stay long at the post-race party. 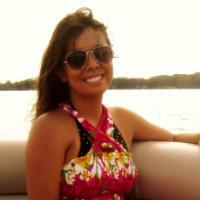 We did take advantage of our free Michelob Ultra beers and other snacks- Sun Chips, bananas, etc. Best of the snacks were definitely the Home Run Inn pizza slices. Really fun for a first race! 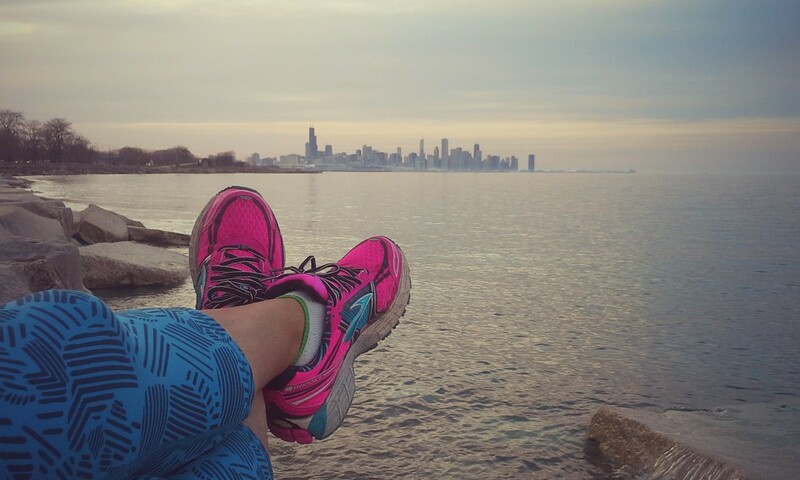 Was great to run through the streets of Chicago. The medal is more of a bottle opener on a lanyard (doesn’t even have the year on it so maybe they’ll use them again next year), but I’ve already made good use of the shirt and gaiter. 8k seems like a great distance to race (for me)- would do it again but prefer a Saturday run to have a day to recover before the work week.